Thornton Hibs will play their Scottish Junior Cup fourth round clash against Renfrew at Raith Rovers’ Stark’s Park this Saturday after two failed attempts at Memorial Park. Heavy rain and a waterlogged pitch forced the cup tie to be called off twice in successive weeks and a third week on the bounce would mean the Hibs would have to forfeit their home advantage and play the game at Renfrew. 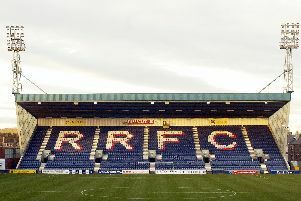 To prevent this from happening the club have booked out Stark’s Park, kick off 1.45pm, with Raith away to Montrose in League One on the same day. It is the first time in 58 years the club have played a Scottish Junior Cup tie at the home of Raith. In 1960 they drew with St Andrews United in the semi-final before losing the replay the following Saturday. The Hibs go into their fourth-round tie this Saturday having stunned and knocked out West Region Premiership opposition already, after a memorable 3-1 win in the third round over Kirkintilloch Rob Roy. Hibs were last action against Forfar West End over a fortnight ago when they lost 4-1, which ended their seven-game winning streak. Renfrew played Auchinleck Talbot last Saturday in a re-arranged league match and despite leading in the game they went on to lose 3-1. Thornton boss Craig Gilbert said: “There’s a great buzz about the place, the Scottish Cup always brings that excitement, you play teams that you don’t normally play. The draw for the fifth round of the Cup takes place on Friday.